It’s another sign of police shooting survivor Leon Ford’s growing national progressive profile. 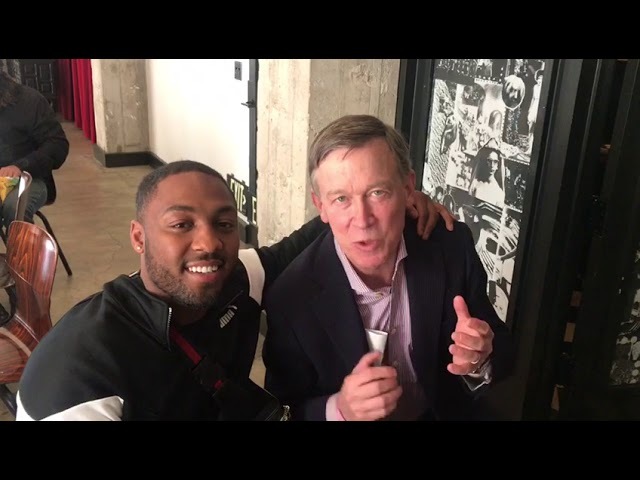 Pittsburgh City Council candidate Leon Ford and Colorado Gov. John Hickenlooper at Summit LA. Perhaps further proving that all politics is local, the Democratic governor of Colorado this week endorsed a candidate for Pittsburgh City Council. Anticipating a few reader questions, we can confirm this type of endorsement in a city council race is unusual. We can also confirm this one wasn’t entirely random. Of course, it’s unlikely the governor of a state three hours away by airplane will sway the outcome of a Pittsburgh municipal primary still six months in the future. But others may. In addition to Hickenlooper, Ford’s campaign this week announced endorsements from State Rep. Ed Gainey, State Rep.-Elect Summer Lee, ex-State Rep. Tony Payton, Jr., and State Rep.-Elect Malcolm Kenyatta. Cleveland City Councilman Basheer Jones was also on the list. Ford, who was shot by Pittsburgh police in 2012 and left with paraplegia and who later settled a lawsuit with the city for $5.5 million, is running as a Democrat for the District 9 council seat currently held by the Rev. Ricky Burgess. District 9 includes East Hills, East Liberty, Friendship, Garfield, Homewood, Larimer, Lincoln-Lemington-Belmar and North Point Breeze. Burgess’ office did not respond to an email seeking comment, and Burgess has declined to discuss whether he plans to seek re-election in the May 2019 primary. Ford has never held or sought elected office before. In announcing his candidacy for the seat, Ford said he would draw on the personal connections he’s amassed through years on the speaker circuit and in the advocacy world in pursuing political office and political change. “I am grateful for this outpouring of support and vote of confidence from these dynamic leaders and proven change-makers,” Ford said in a statement about first-round endorsements like Hickenlooper’s, nods that offer further evidence of Ford’s growing national profile. Ford says he was inspired to run for City Council by the fatal police shooting of 17-year-old Antwon Rose II in East Pittsburgh this past June.